In the ever-changing social media landscape, we marketers are often on the prowl for meaningful data and insights to understand what works, what doesn’t and where our opportunities may lie. As a result, we often turn to industry research and studies, which often feature benchmarks that help us better internalize our own metrics and understand how we stack up to the competition. While most studies offer incredibly insightful and useful information, one component may be missing: industry context. Earlier this year, Rival IQ released its 2017 Social Media Industry Benchmark Report, featuring unique benchmark data for six different industries: Media, Higher Education, Non-profits, Food & Beverage, Fashion and Health & Beauty. Key performance indicators like engagement rate, the number of clicks on a social post, or hashtag engagement rates tells a lot about what is happening as a result of activities. But it says nothing regarding whether the efforts are successful, failing, or where to focus on closing those gaps. Why? Because benchmarks are relative. … It’s easy to compare against the best, we all know those brands. That comparison often proves worthless. Comparing yourself to only the best and biggest brands is a disservice to the work your team has invested in social media. As we near the end of the year, you’re undoubtedly preparing your 2018 social media marketing strategy. Below I share some of the report’s industry-specific opportunities for upping social engagement that deserve your consideration. Opportunity #1: Use more video on Facebook and Twitter. 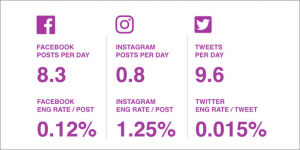 According to the study, media companies boast the highest number of posts per day on Facebook and Twitter, but also the lowest engagement rates at .12% and .015%, respectively. Coming from a journalism background, this certainly didn’t surprise me. As the news happens, media organizations use social media to spread the word—and even a slow news day produces plenty of shareable fodder. But most of that shared content are links to on-site content, which requires the user to take another step to consume the content. As a result, media companies have the opportunity to not only draw more eyeballs in, but keep them there longer by incorporating more video into their social media strategy. Opportunity #2: Invest in Instagram. This finding is pretty straight forward. 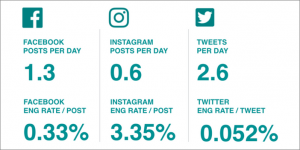 According to the report, Instagram gets the least amount of love on a daily basis, with the average post per day being just .8. 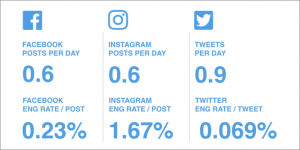 However, the engagement rate on Instagram is exponentially higher at 1.25%, signaling that Instagram audiences are ripe for more content. Opportunity #1: Repurpose Facebook videos for Twitter. According to the report, non-profits are “owning” native video, but they may not be utilizing it effectively across all their social channels. As you can see from the graphs below, video is much more prevalent on Facebook than on Twitter, but engagement in that type of content is high on both platforms. Based on the findings, Rival IQ suggested repurposing Facebook video content (or perhaps going native) for Twitter to help up engagement rates. Opportunity #2: Leverage high-performing hashtags. Like the media industry, non-profits have some opportunity with Instagram. 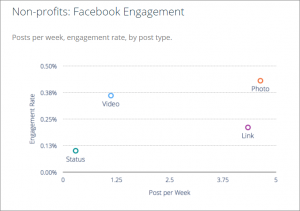 According to the report, by just increasing posts per day by .2 (one more post every five days) non-profits could see a lift in engagement. Furthermore, using trending and high-performing hashtags (and related subject matter) such as #VeteransDay in their posts could lend a boost, too. Opportunity #1: Up the number of status updates on Facebook. According to the report, colleges and universities boast some of the highest engagement rates compared to the other industries in the study. But what’s most interesting is that simple status updates do almost as well as video and photos. 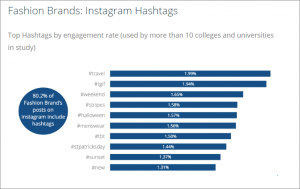 As a result, Rival IQ suggests that higher education organizations could up the number of status updates on Facebook and still receive great engagement. Opportunity #2: Add visual elements to tweets. 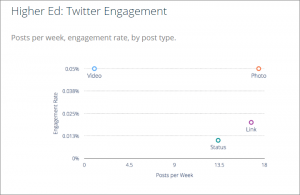 While visuals aren’t necessarily an essential for higher education Facebook audiences, they’re a big opportunity for Twitter audiences. 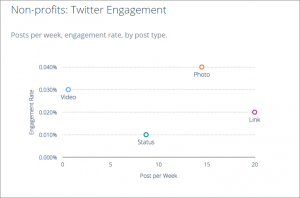 As you can see in the graph below, tweets with videos or photos have a significantly higher engagement rate. Opportunity #1: Incorporate more video across social channels. 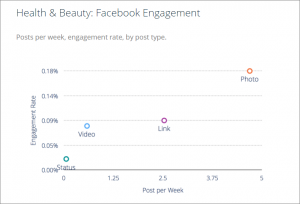 Social posts featuring images are the most common type of posts among fashion brands, and while they get the most engagement, video is a close second—but less posts contain videos. As the power of video becomes increasingly evident, fashion brands may want to incorporate more into their social strategy to drive more overall engagement. Opportunity #2: Re-evaluate hashtags to make sure they are relevant to the audience. According to the report, the top hashtags that fashion brands are currently using only provide slightly higher engagement compared to the other industries studied. Some of those top hashtags include a mix of holiday, lifestyle and fashion-related hashtags. As a result, it may be worth it to go more industry-specific and focus on those fashion-related hashtags to be more relevant and boost engagement. Opportunity #1: Focus on photos. Video is undoubtedly an engagement driver and opportunity for most industries, but according to the study, that’s where the health and beauty industry differs. In fact, photos trump video in engagement on Facebook and Twitter. 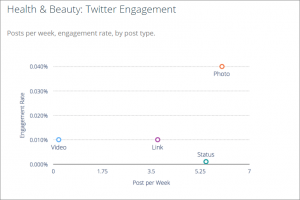 This signals that health and beauty brands should double-down on the creation of quality, compelling photos for use across their social channels. Opportunity #2: Use industry-related hashtags. When it comes to Instagram, Rival IQ’s study found that industry-related hashtags such as #moisturizer or #healthyskin—rather than just top-performing or trending hashtags like #ValentinesDay—get better engagement. So, health and beauty brands should absolutely be leveraging those industry-related hashtags to stay relevant and encourage engagement. Opportunity #1: Invest in compelling imagery for use across channels. Photos are the most common type of social posts for food and beverage companies—and for good reason. They drive high engagement. As a result, food and beverage brands should absolutely be investing in high-quality, compelling imagery that will resonate with their audience. Opportunity #2: Get on the Twitter bandwagon. According to the report, food and beverage companies are rocking it on Twitter, significantly outperforming other industries. So, if you’ve been wondering whether Twitter is worth the investment, it may be a good time to incorporate Twitter into your strategy. Read the full Rival IQ report here. 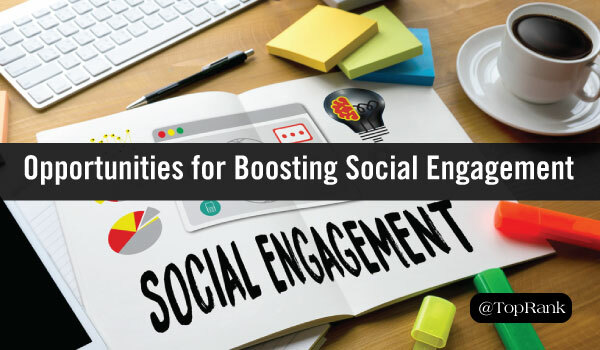 Simply put, there’s no one-size-fits-all strategy for fostering engagement on social media. While many industries have the same high-level opportunities for adding video, producing quality images and refining hashtagging strategies, there are nuances and caveats that are industry-unique. So, as you work to refine your strategy today, tomorrow and beyond, do so with your unique industry and audience at the forefront of your mind. However, don’t neglect the great things happening outside your industry bubble. After all, a little inspiration can go a long way. Looking for a little of that inspiration? Check out our post What All Marketers Can Learn from Fast Food Giants Crushing Twitter. Have some insight to lend on this subject? Share your thoughts in the comments section below.